Using the techniques for mixing Patterned Papers in Patterned Paper Tutorial #1, we followed much the same ideas here using papers from the Crate Paper.com Bliss Collection - a lovely collection of shades of Pinks, Greens, Browns, Tans and Yellow florals and solids on a nice heavy weight double sided card stock. This full collection comes with 8 patterns with 8 solids on the reverse side, 16 self-adhesive chipboard pieces, 21 Art Brads, a 6 x 6 inch sheet of Rub Ons, 16 Journal Stickers, 24 Title Stickers, and 6 border stickers all to match these gorgeous papers. When I did these layouts I did not have any of the rest of the kit, with the exception of a few of the brads. 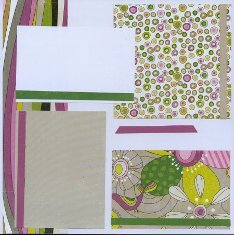 It can be purchased on-line at scrapbook.com - just search for Crate Paper & Bliss. I purchased these items for a workshop at a Croptopia event in Charleston, SC in July 2010. 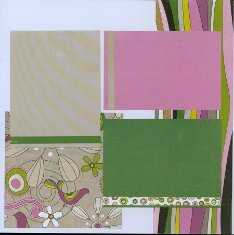 This first set of layouts focuses on the Pinks and Greens in the collection and uses two obvious floral patterns of the Dreamy and Lucky and the subtle circular pattern in the lime green called Mod. The solid mattes are the reverse of the same papers. 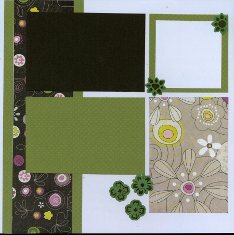 A die cut from the green that says "Shop till you Drop" and a few die cut flowers attached with brads from the kit. 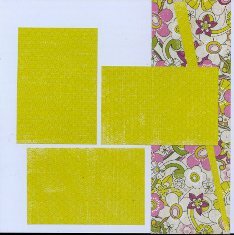 This next layout uses the same two florals with the subtle yellow pattern called Zest for the photo mattes. I have used a plain white cardstock as background for the right layout since the prints also use white as the background. For the left page I used the yellow photo mattes on the solid yellow background and used a second white matte under the yellow mattes to accent them. 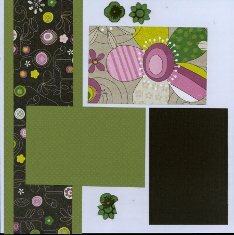 Really like this paper, check out these two stunning layouts using these beautiful papers on scrapbook.com! This next set of layouts uses two of the patterned floral papers, bringing in the wavy striped pattern of Spirited and solid color photo mattes. Again, I used a white card stock for the background. Each photo matte has a 1/4 inch paper ribbon to accent it. 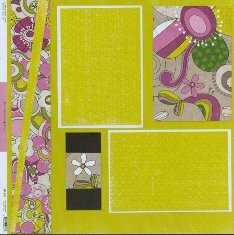 This last set of layouts uses the tans and browns of the Groovy and Impulse again on the white background. I was out of green paper by that time, so I used a piece of Lime Green Bazzill Dotted Swiss cardstock for the mattes and paper ribbon accents. It was a perfect match for the green in the patterns. 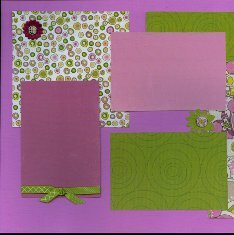 I made these eight layouts using only 8 pages of patterned paper and the white background cardstock and the one lime dotted swiss paper and I still had some pieces left of the patterned paper. A little does go a long way! I have not added photos yet, but I will keep these layouts together along with the left over scraps until I have photos to add to them. The scraps will come in handy for titles, journaling blocks and other accents when I use them. I also used only a little adhesive to attach the photo mattes so I can move the from portrait to landscape depending on the photos.